All American Marine, Inc. (AAM) built and launched a 150-passenger hybrid electric vessel for Kitsap Transit. The aluminum catamaran was designed by Glosten, Seattle, WA, and will operate during peak times on Kitsap’s Bremerton-Port Orchard or Bremerton- Annapolis routes. The 70 x 26 ft. USCG certified passenger ferry features an efficient aluminum catamaran hull, ADA access throughout the main deck, and twin BAE Systems HybriDrive propulsion systems driving fixed pitch propellers. The HybriDrive propulsion system includes a generator, propulsion power converter, house load power supply and control system. This will be the first hybrid-electric passenger ferry in Puget Sound, and is a clear sign of environmental stewardship. 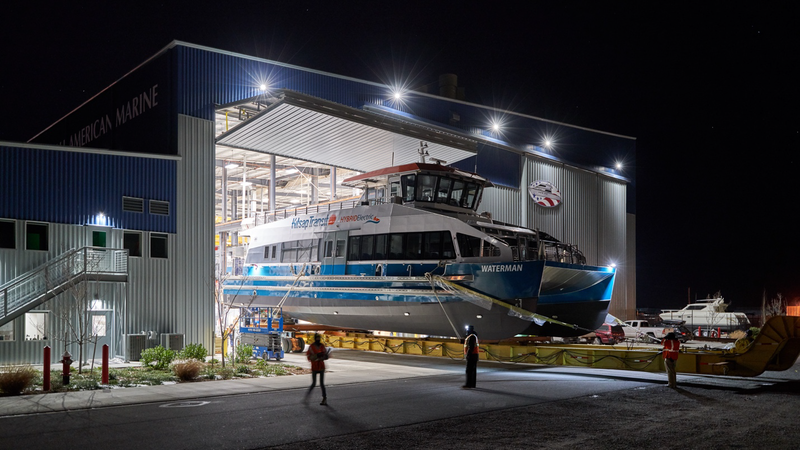 The Glosten team worked closely with Kitsap Transit to create a ferry customized for Sinclair Inlet, but flexible enough to meet future needs. Passenger comforts were of particular importance to this design and include a variety of passenger spaces with lots of natural light, a unique ADA-accessible bow, and a spacious passenger cabin and sun deck.